What is the cost of Prolacta human milk products? REFERENCES: 1. Abrams SA, Schanler RJ, Lee ML, Rechtman DJ. Greater mortality and morbidity in extremely preterm infants fed a diet containing cow milk protein products. Breastfeed Med. 2014;9(6):281-285. 2. Hair AB, Peluso AM, Hawthorne KM, et al. Beyond necrotizing enterocolitis prevention: improving outcomes with an exclusive human milk–based diet. Breastfeed Med. 2016;11(2):70-74. 3. Ganapathy V, Hay JW, Kim JH. Costs of necrotizing enterocolitis and cost-effectiveness of exclusively human milk-based products in feeding extremely premature infants. Breastfeed Med. 2012;7(1):29-37. 4. Johnson TJ, Patel AL, Bigger HR, Engstrom JL, Meier PP. Economic benefits and costs of human milk feedings: a strategy to reduce the risk of prematurity related morbidities in very low birth weight infants. Adv Nutr 2014; 5:207-212. 5. Hamilton BE, Martin JA, Osterman MJ, M.H.S., Division of Vital Statistics. Births: Preliminary Data for 2015. National Vital Statistics Reports. 2016;65 (3): 1-15. 6. Johnson TJ, Patel AL, Jegier BJ, Engstrom JL, Meier PP. 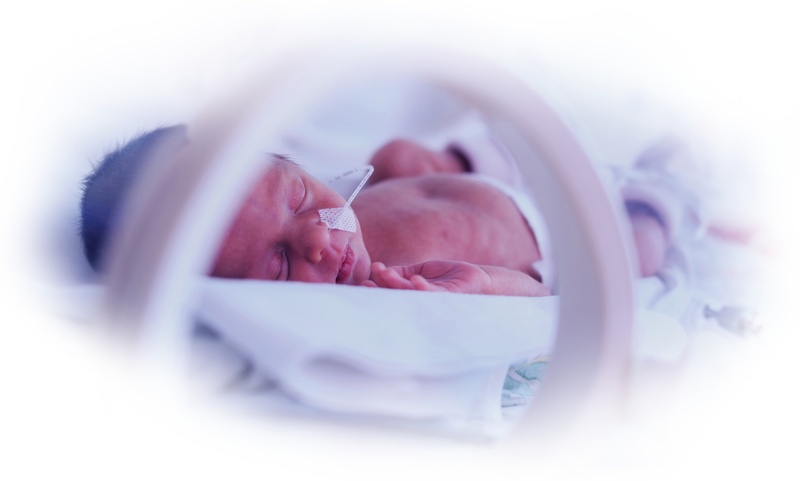 Cost of Morbidities in Very Low Birth Weight Infants. The Journal of Pediatrics. 2013;162(2). doi:10.1016/j.jpeds.2012.07.013. 7. Black L, Hulsey T, Lee K, Parks DC, Ebeling MD. 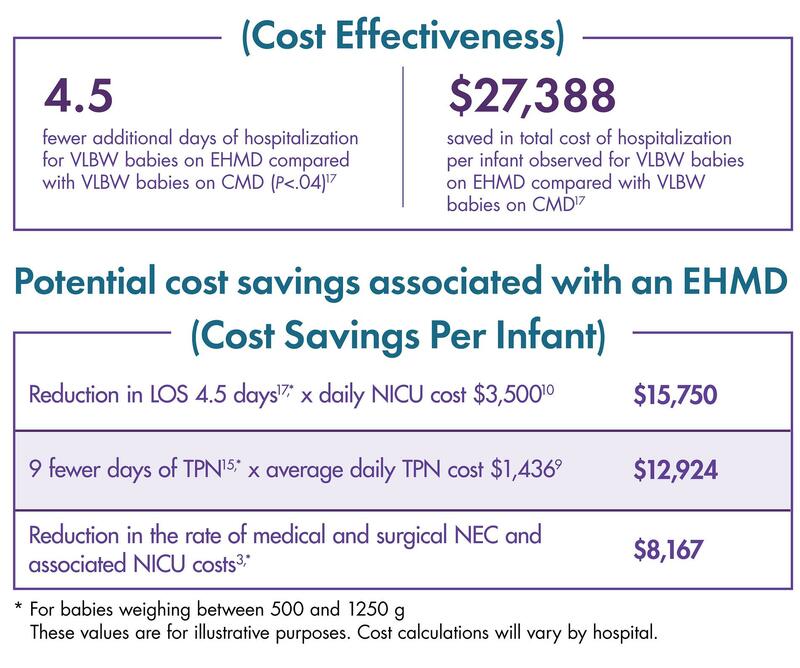 Incremental hospital costs associated with comorbidities of prematurity. Manag Care. 2015;24(12):54-60. 8. Turck CJ, Marsh W, Stevenson JG, York JM, Miller H, Patel S. Pharmacoeconomics of surgical interventions vs. cyclooxygenase inhibitors for the treatment of patent ductus arteriosus. J Pediatr Pharmacol Ther. 2007;12(3):183-193. 9. Edwards TM, Spatz DL. Making the case for using donor human milk in vulnerable infants. Adv Neonatal Care. 2012;12(5):273-278. 10. Muraskas J, Parsi K. The cost of saving the tiniest lives: NICUs versus prevention. Virtual Mentor. 2008;10(10):655-658. 11. American Academy of Pediatrics. Breastfeeding and the use of human milk: section on breastfeeding. [published online ahead of print February 27, 2012]. Pediatrics. 2012;129(3):e827-e841. doi:10.1542/peds.2011-3552. 12. Hair AB, Hawthorne KM, Chetta KE, Abrams SA. Humanmilk feeding supports adequate growth in infants ≤1250 grams birth weight. BMC Res Notes. 2013;6:459. 13. Rochow N, Raja P, Liu K, et al. Physiological adjustment to postnatal growth trajectories in healthy preterm infants. Pediatric Research. 2016;79(6):870-879. doi:10.1038/pr.2016.15. 14. Sullivan S, Schanler RJ, Kim JH, et al. An exclusively human milk-based diet is associated with a lower rate of necrotizing enterocolitis than a diet of human milk and bovine milk-based products. J Pediatr. 2010;156(4):562-567. 15. Cristofalo EA, Schanler RJ, Blanco CL, et al. Randomized Trial of Exclusive Human Milk versus Preterm Formula Diets in Extremely Premature Infants. The Journal of Pediatrics. 2013;163(6). doi:10.1016/j.jpeds.2013.07.011. 16. Lee ML, Rechtman DJ, Lucas A. The effect of an exclusive human milk (EHMD) diet on the incidence of necrotizing enterocolitis (NEC) in the US: an epidemiological evaluation. Poster presented at: 2nd International Neonatology Association Conference; July 2016; Vienna, Austria. 17. Assad M, Elliott MJ, Abraham JH. 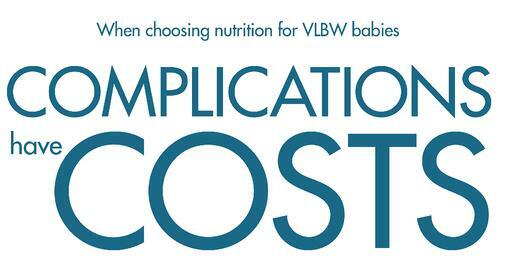 Decreased cost and improved feeding tolerance in VLBW infants fed an exclusive human milk diet. J Perinatol. 2016;36(3):216-220.